Menswear retailer Knot Standard is merging a high-tech approach with old-world tailoring to virtually recreate the Savile Row experience. relies on virtual reality to ensure a bespoke fit every time. “Knot Standard actually began with the traditional tailoring model, where experienced pattern makers and tailors cut suits by hand,” said Morty Singer, CEO of Marvin Traub Associates. “Quickly however, they noticed that this was not a scalable business. The beauty in the hand-craftsmanship of traditional tailoring was also its Achilles heel, no two suits were ever cut exactly the same. “Knot Standard then set out to design a modern supply chain fueled by technology to fix this issue,” he said. “Their proprietary logistics systems include digital cutting techniques, which allow the company to replicate a customer’s measurements every time. Marvin Traub Associates is a key investor and advisor for Knot Standard. Founded in 2010 by John Ballay and Matt Mueller, the menswear retailer aligns with Marvin Traub’s vision for the future, where luxury is driven by customer experience and customization. Knot Standard provides its discerning male clientele with custom suits, blazers and pants using fabrics from the menswear market’s best brands, including Loro Piana, Ermenegildo Zegna, Ariston, Dormeuil, Vitale Barberis and Holland & Sherry, among others. Through its recently launched Virtual Studio, Knot Standard allows consumers to create and order custom suits all without stepping inside a bricks-and-mortar storefront. By selecting elements of a suit, such as fabric and linings and other customization points, through its online portal, consumers can create a total of 4.5 trillion possible designs. As bespoke options are selected, from stitching to button choices, and beyond, the suit is visualized digitally in life-like 3D form. To recreate the tailoring experience, Knot Standard has photo rendered each of its 7,000 fabric swatches onto customized garments for realistic interactions not previously possible online. Once the consumer makes his choices from Knot Standard library, he can be fitted either at the brand’s network of boutiques across the United States, and an outpost in Dubai, United Arab Emirates. Knot Standard will soon make its debut in Bloomingdale’s in New York as a shop-in-shop. If stopping by a showroom is not possible or unwanted, the consumer can send Knot Standard his basic body measurements by following the steps outlined in easy-to-follow videos. With the given measurements, Knot Standard then creates a digital print for a specific consumer’s body. “We believe the company’s Virtual Studio is the best online custom suiting experience on the market,” Mr. Singer said. “The challenge with shopping for a custom suit online is visualizing the end product of what you’re designing. “Many companies let you select a fabric and then select from a wide range of customization options,” he said. “However, when it comes to checkout time, you see a stock image of the fabric you selected. You are not actually seeing the suit you just took the time to build. After a garment is designed, Knot Standard special orders the consumer selected fabric from its Italian and English mills. Then the fabric is laser-cut to using the consumer’s digital print to assemble the garments by hand, including canvassing and functional buttons. 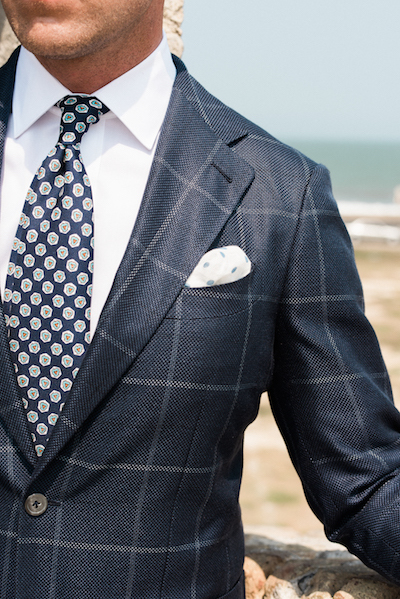 Each garment is finished with Knot Standard’s trademark Milanese boutonniere. Since the garments are handcrafted, each order takes between four to six weeks to complete. Orders can be delivered to a Knot Standard showroom, or directly to a consumer’s home or office worldwide. If help is needed during the process, Knot Standard has professional stylists on-hand to walk consumers their orders either online or in the showroom. Virtual try-on and online customization have been gaining ground in the luxury space, as consumers have come to expect digital touchpoints. 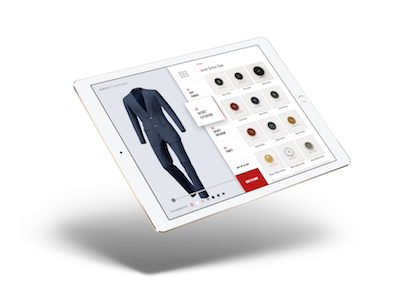 For example, Italian fashion house Brioni has created a digital component to its made-to-measure tailoring to help consumers visualize a completed custom look. Brioni’s “Miror” uses 3D technology to show virtual representations of what garments will look like in different fabric and fit options. Allowing consumers to visualize on a screen how their particular choices will look may make the in-store consultation process less overwhelming.The digital mirror is projected onto the physical mirrors in both boutiques. During the roll out, more pieces were added, allowing a consumer to see the entire range of choices, including look, fabric, color and accessory. 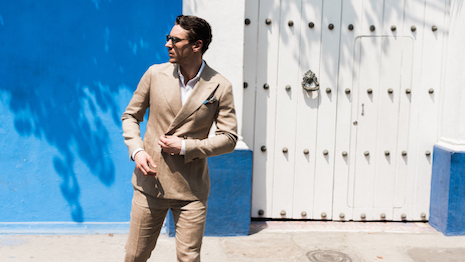 Brioni’s sales associates and tailors assist the consumer as he goes through all of the options available. The brand has determined that there are around 8 million styling options, with 1,500 fabrics to choose from (see story). Consumers are increasingly looking for instant gratification, but wish to do so without losing our on quality. The immediacy of Knot Standard aims to answer this call. “Knot Standard has addressed this dichotomy by allowing its customers to shop however they prefer whenever they prefer,” Mr. Singer said. “Knot Standard started online so this channel is core to their model. “However their online offering has recently been upgraded dramatically by their new online virtual studio. The online virtual studio allows customers for the first time in history to design and style bespoke suits in like-3D,” he said. “The company also operates eight showrooms across the U.S. and Dubai, which allows customers to shop for Knot Standard in person if they prefer.